I’ve been playing with making ART and what that means to me over the summer. Lots of inner critic rumbling when I think of creating visually. My favorite style has been cut outs from magazines—mini vision boards, I never get tired of those. Lisa aka The Mountain Mermaid is an amazing artist and creates inspiring and inviting art. 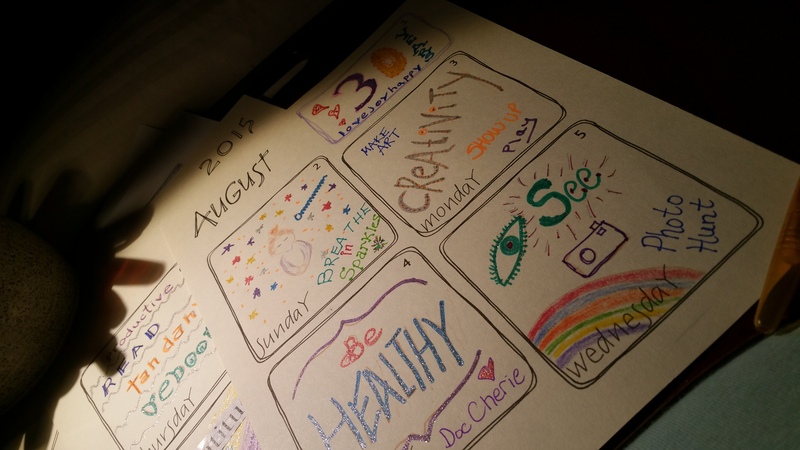 I was immediately IN for Doodle Days Musings Adventure during the month of Aug. Lisa provides a calendar plus extras and you Doodle your day as a visual journal. I’d procrastinated listening to ‘sap’ say you’re not ‘artsy’; you don’t have the right tools; you’re too far behind; etc. Last night I ignored her. I committed to doing the first three days and the 1st was easy that was our 30th anniversary, lol. It was childlike bliss. Freeing, playful, no rules, no lines. I used colored pencils, colorful sharpies, and new sparkly markers, and even highlighters. I was so into it and in the moment that I Doodled all nine days! I’m off now to Doodle my day for today! 10 Aug	This entry was written by Laura and published on August 10, 2015 at 7:22 pm. 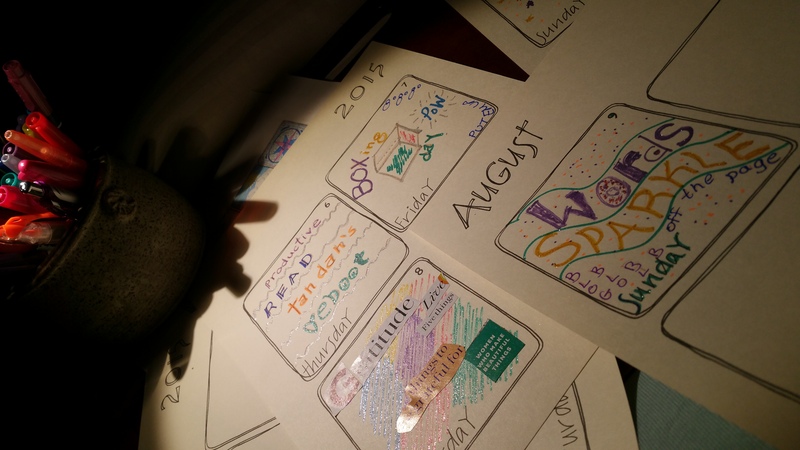 It’s filed under Color, Commitment, Creativity, Journaling, Just for fun, Laura, Lifeology, Summer. Bookmark the permalink. Follow any comments here with the RSS feed for this post.